Second day of the stay, the plan was to reach Krzemieniec, the peak where Polish, Ukrainian and Slovakian borders converge. Just as the first day, the night was rainy and it did not look better for the day, but unlike the first day, now the situation repeated here in the hills, not in the city now far away. While we boarded the bus in very faint rain, it changed to worse while it carried us some 10 minutes on the main road to reach the start of the trail. It was now raining consistently, though it was still not too bad. This fact probably saved us a bit of coin, as entering the national park (Bieszczadzki Park Narodowy) costs 6 PLN/day (roughly 1,4€ or 1,6$) but in this terible weather and the main hiking season gone, the shack selling tickets and souvenirs was closed. The rain increased slightly, but walking in cover of trees made that less annoying, for now. 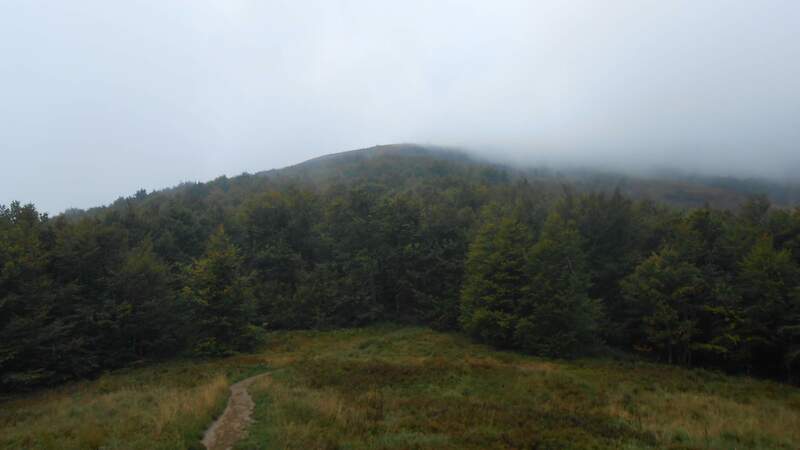 We ascended slowly in the dampness of beech forest, hoping that the rain will be less annoying with time as someone told us that forecast was not so bad for later in the day. Shortly before leaving the forest, we met two Polish hikers that went in the opposite direction, most likely camping somewhere at the main ridge. Going downhill in the increasingly muddy path was quite harsh and I was glad I am going upwards. 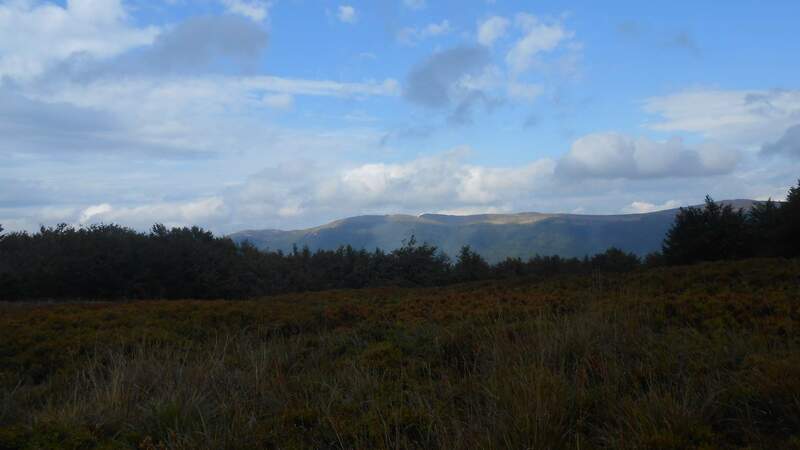 The landscape gradually changed to grassland and thus standing on the peak meant being exposed to the rain (now slightly weaker) and wind that was quite unpleasant. 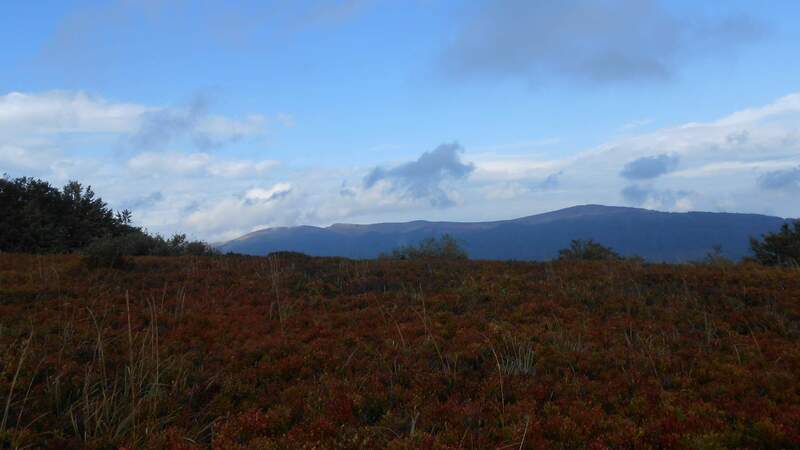 Anyway, the first peak, ‘Wielka Rawka’ with 1304 meters of elevation was done. 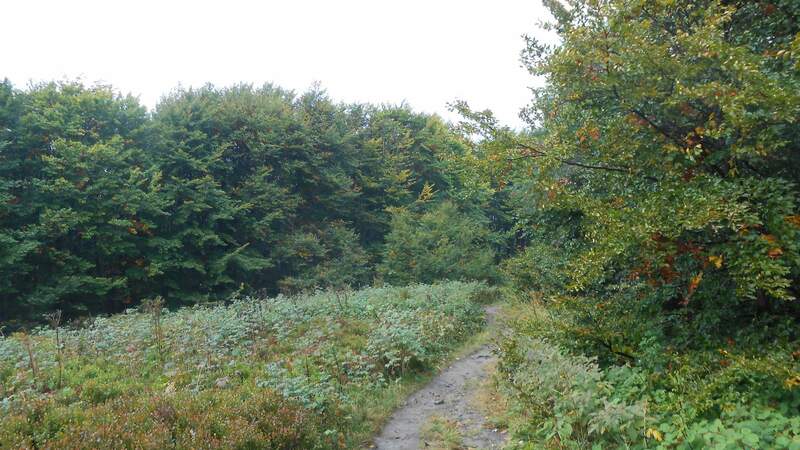 From there, the path descended towards the border between Poland and Ukraine. Eventually we dropped to some maybe 1180 meters before ascending slightly to Krzemieniec peak at 1221 meters and continued a few meters behind it to the tripoint, which is not precisely at the peak itself. This was the reason I was there. Apart from being a place where three countries converge, it is also the east-most point of Slovakia. 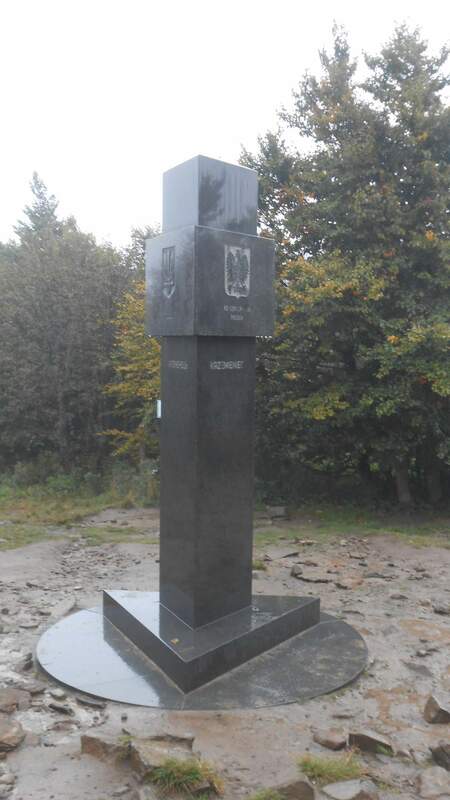 The monolith there is quite simple with coat of arms and the peak’s name in all three languages (Krzemieniec in Polish, Kremenec in Slovak and Кременець in Ukrainian) facing in the appropriate direction. Eventually I had a photo of myself taken here, not in nice weather as I hoped, but standing in cold ran (as the raining increased meanwhile) and with my garb increasing wet, considering myself lucky it still did not soak through. 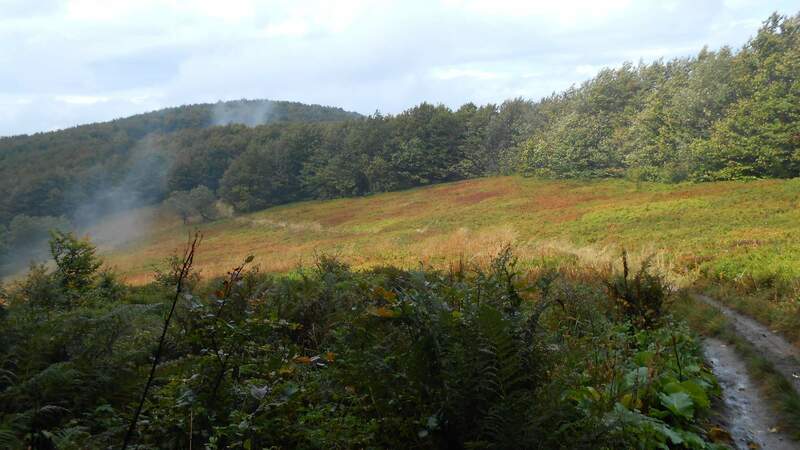 This point being done, we returned the ~1,5km to Wielka Rawka and continued on the grassy plain to its lower sister, Mała Rawka (elev. 1271). The rain was now almost gone, but instead of it there was mist and wind again. From Mała Rawka we took a path leading along the downward ridge towards our destination, one of the villages down in the valley. Soon, we were in forest again, one that was often interrupted by small fields with blueberry or raspberry shrubs. While the clouds were not fully gone, the rain was, or so it seemed. The wind was still not fully gone, which helped us slightly as it could blow away the dampness of our wet clothes. Eventually, a bit of sunlight poked through the clouds. We became optimistic that maybe it’ll go quite well. I remembered the two hikers we met at the start and pitied those who would go the same trail as they did (it would go from the tri-point roughly parallel with our trail, on the PL-SK borded) as that was still hidden in clouds that seemed to reach only to the valley between the two trails. That gave us a few chances to look north to the peaks that were planned for third day, before we descended enough to continue only through uninterrupted forests. Eventually we reached the east end of Wetlina village and as the weather seemed to be stable, we decided to take a break for a cold beverage (cola for me, beer for the rest) at local campsite. We remained there for 45 minutes, which proved to be a dire mistake. By that time, our clothes were almost dry, but within two minutes of leaving that place to go down through the village and look for the pick-up point, the rain was back with a vengeance. Five minutes of intense raid did what the three hours of weak rain could not. Having over two hours left to the time our bus would come to gather us and with nowhere to hide from the rain, we faced a hard decision: what to do? There was a small grocery store with a post that gave us solution. The text was short and simple: “BUS całodobowy” (translation: non-stop bus) followed by a phone number. Yes, BUS is quite exaggeration, as in these parts public transport is done mostly by minibuses in the size of larger van, but for the 10 of us, that’s exactly what we needed. Damn. What’s the international phone prefix for Poland? After a short while of thinking, someone went into the shop to ask the local, who was nice enough to call the number himself, from his own phone, and after quite familiar and hilarious conversation (I guess people from these villages know each other well), he told us to expect our transport right here in a few minutes. So, few minutes later, the soaked ten of us boarded what was pretty much a van modified for people transport (with windows and two rows of seats instead of the cargo room) were driven towards the hotel. For 80PLN ( ~19€) total for 10 people across almost 30 km in mountainous terrain. After reaching the hotel, we sent our tour guide a message with named list of the 10 of us, so he knows who to not expect there. Good news was that the rain stopped before dinner. But we still had to hope our clothes would dry at least a bit overnight. Event map (16.-19. 9. 2017), day two drawn by black line. Note that the tripoint (and border) is quite off in the base map (if you zoom in). The actual tripoint at the south-most point of the trip (the black line).